wmay wrote: How does Tangled/Rapunzel fit into the whole Sea concept? Raging Spirits and the Magic Carpets attraction. And for those who stay at the new hotel, too. Plans can change of course, but that's the best connect I can give you, for now. It could have been called DisneyWaters, right? P.S. Anybody notice, like I did, that this is a rather big number of "boat rides" opening, all at once? Just curious about this, and each ride's use. Honestly when you look into it Arabian Coast is 99% Agrahbah from Aladdin which isn't exactly a coastal city, and the only ride in that land that fits the sea theme is Sindbad. I like the backstory they've provided, it already makes far more sense than Toyville Trolley Park in American Waterfront! And with Neverland the sea is very prominent (y'know all dem pirates and stuff), maybe less with Frozen/Tangled but we're getting 3 BOAT RIDES. TDR doesn't play around with boat rides they got the best Splash Mountain, the best Small World, Pirates with all the original scenes (yes they still wants the redhead and chase the women), and SINDBAD THE GOAT. DisneySea + boat rides is a big deal!!!! Also DisneySea ironically needs a flume/shute the choots and Frozen could fill that void! You guys....the Pan Boat ride will likely NOT be a boat ride. Though, you're in a Boat Gondola, it's flying. It basically sounds like a different/updated version of the current ride at the park. So, it's really only two boat rides. And, I'd guess Frozen will be the thrilling one, and Tangled will be the Gentle one. I updated the announcement post with a newly-released piece of concept art overlooking the entire expansion from the top of the new hotel. This new port looks gorgeous! The Peter Pan one is interesting because of the line "3D imagery". Sets + screens? Their take on Universal's screen rides? Pixie Hollow sounds like a walk thought / meet and greet. Frozen is interesting, maybe the thrill aspect of it is more in line with Splash Mt. than say POTC? One can hope. And there is no doubt it will be physically stunning. That hotel though, pretty amazing exterior. Next level design there. would appear to be floating down a river, and then magically rising up above, and "into the sky" etc. Possible I suppose. A lot of double track work, definitely. But no above-the-boat suspension rail, either. Imagine what the morning rush at TDS will look like once this new port is open. It's going to be a very long sprint from the entrance gate. The guests coming in from the new hotel will probably be able to get several rides in before the regular guests start making their way into the very back of the park. in Mysterious island a bit easier to get on, and get FastPasses, etc. 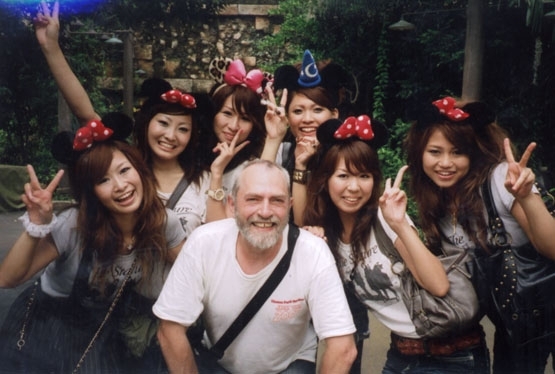 Myself and our FanGurls on our First Ever Visit to TDS ~ TPR 2007 Japan Tour. And this is Mike in the middle of..... Our Gurls. Now, where did Peter's photo with them, go to? Hmmm. Soarin' lines are probably going to be a nightmare when it opens. Remember when Toy Story Mania first opened at TDS? Last edited by KPTSN on Mon Jul 02, 2018 4:09 pm. ^ I also realized, with all the new stuff eventually opening, the massive crowds will head to the right side of each - park! and the new Big Hero 6 attraction, and a brand new actual (not a cart)... Popcorn Shop (!) in TDL. then to the Flying Carpets, and there's Magic Springs. (I'm calling it that, for now). ...With many popcorn flavours (I hope) and souvenir buckets available! Tokyo Disneyland’s Disney Natsu Matsuri is inspired by Japan’s Summer Festival celebrations and is a great way to witness Japenese culture with a Disney twist. At the center of the event is Sansui! Summer Beat, a colorful dance party featuring high tempo music, choreography, and Disney characters spraying water into the crowd. “Sansui” means “sparkling sun and water” and the show is true to its name, if you’re close to the action, you will get wet! Sansui! Summer Beat features 100 performers in traditional Japanese dress. Including Mickey Mouse, Minnie Mouse, Pluto, Donald Duck, Daisy Duck, Goofy, Max, Chip, Dale, and Clarice. The show will take place three times per day with five floats traveling along the parade route to the Plaza and Castle Forecourt for the main show. Of course, there is merchandise and food/beverages to enjoy, especially created for the Sansui! Summer Beat. Get too close and you will get WET! Photo from Disney. Some of the food and beverages available during Natsu Masuri.